If you think heavy workload at office, unending work at home, and crazy traffic (not necessarily in that order) are taking a toll of your health, relax! How about squeezing in these lifestyle tips into your daily grind. Leonardo da Vinci is believed to have taken little power naps now and then during the course of his punishing daily schedule. Each little nap rejuvenated him. You could take a leaf from Da Vinci’s book and take little power naps during your work days. It could be as simple as closing your eyes for 5 minutes 4 times a day. As an alternative you could also take a small walk or have a cup of tea at the cafeteria. Caveat: Watch out! Power naps could get you in serious trouble in some offices. Sitting glued to your chair and staring at the screen for hours together could affect your eyesight and lead to backache. Utilise your mini-breaks to break away from the monotony of having to stare at your screen for too long. Now and then, rinse your eyes with water. For those of you who hardly find the time to exercise, this could be a teeny-weeny workout. Taking the stairs or better still racing up the stairs instead of taking the lift revs you up. This is especially true if you are feeling sleepy. Avoid the possibility of getting a backache. Indulge in chair exercises. Look up the Internet and become a chair exercise junkie. At any cost, avoid a bad posture when working. If you are feeling low and down in the dumps, try jogging your memory back and soak into some memorable events in your life. Or else have a joke book handy at your workstation. You could even paste great jokes or quotes on your pin-up board. Laugh out your stress. Never skip lunch or go hungry for long periods. Unknown to you, you could be opening up a Pandora’s box. You must have all heard “Health is Wealth”. The more comfortable your clothes the more comfortable will you be at work. Tight clothes which are tearing at their seams will hinder your concentration and bring down your performance. Tight or ill-fitting clothes are also a health hazard. Begin your day on a happy note and remain happy throughout the day. Negative thoughts are a no-no. Spank them out of your mind in whatever way you can. Negative thoughts only land up ruining your day. A badly lit workplace will in all probability hurt your eyes. Ensure that sufficient light is falling on your table from behind you. Avoid working in darkness. If your workplace has become an Antarctica watch out! You are neither a penguin nor a polar bear and your colleagues aren’t too. Either cover yourself in layers of clothing like an Eskimo or collectively take up the issue with the concerned department. 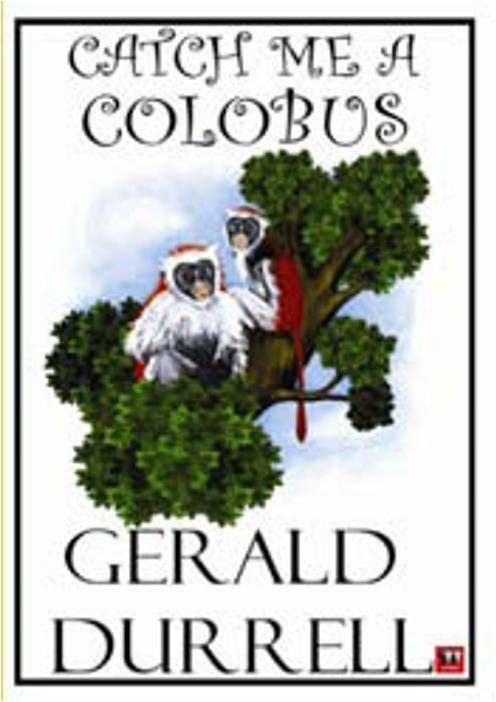 ‘Catch Me a Colobus’ is a brilliantly written book which lays a great deal of emphasis on conservation of flora and fauna. This Gerald Durrell book consists of ten elaborate and eloquent chapters. All of them are based on true-life incidents in the life of the popular conservationist, naturalist and writer. After one reads this book he or she will agree that zoos are not a cruel concept as long as they are maintained properly and guidelines are followed. They are in fact the last refuge for critically endangered species. Many unheard of species would have been completely obliterated if not for the yeoman efforts of men like Durrell. Some of these include the North American buffalo, the Saiga antelope, the volcano rabbit, the Pere David’s deer, the Przewalski’s horse to name just a few. ‘Digging up Popocatepetl’, a chapter describing the author’s expedition to Mexico to collect and breed volcano rabbits, thick-billed parrots, horned guans and quetzals is one of the most absorbing narrations in the book. ‘Leopards in the Lavatory’, ‘Catch Me a Colobus’, and ‘Keep Me a Colobus’ detail the author’s arduous expedition to West Africa to collect exotic species like the Colobus monkeys and are very interesting. The death of many animals in Durrell’s zoo in spite of the best efforts of the staff and veterinarians will give you the goose bumps. You’ll know why maintaining a zoo can be quite a trying and back-breaking job. Durrell couldn’t afford to take a break in spite of breaking a couple of ribs during the African expedition! To save what is left of our precious flora and fauna from extinction we need more Gerald Durrells. This book is an eye-opener! Do read it. “The second species was the Passenger pigeon, and it was probably the most numerous species of bird that has ever been or ever will be in existence in the world. Flocks of them estimated at two billion used to darken the skies. The weight of their numbers perching in trees could break off quite large branches. It was impossible, everyone thought, that Passenger pigeon (so delicious to eat and so plentiful) could ever be exterminated. And so they killed and killed; they shot the parent birds, they robbed the nests of the eggs and young. In 1869, seven and a half million birds were captured in one spot. In 1879 a billion birds were captured in the state of Michigan. This because it was ‘impossible’ to exterminate the Passenger pigeon. It was too numerous. It bred too well. Last Saturday I realised that there is more to V V Puram (Vishweshwarapuram) than the famous Food Street or Thindi Beedi and of course the Avarekai Mela. When tour and walk organiser Unhurried.in announced an afternoon food walk in this part of the city I presumed it would be at the Food Street. But then the Food Street springs into action only after 4pm. I was a little confused and decided to check out. 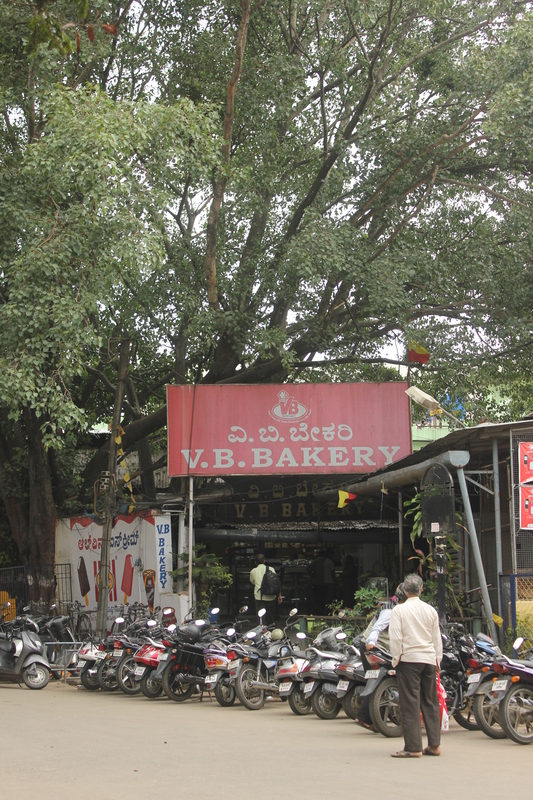 Thanks to heavy lunch-hour traffic I reached V B Bakery (short for Vishweshwarapuram Brahmin’s Bakery), the starting point for the walk, a quarter of an hour late. I was the last to reach 😦 . Mansoor Ali, Unhurried’s food and architecture expert, was the walk leader for the day. As a starter we were asked to pick up an item of our choice from the bakery. I chose the Congress bun, one of the bakery’s signature items. The concoction of butter and Congress kadalekai sandwiched between two slices of bun just melted in my mouth. I loved it! The Food Street, which is on the left side of the bakery, wore a deserted look which is when I realised that the walk was not on Food Street. Our lunch stop was the New Modern Hotel, a stone’s throw away from V B Bakery. A bright art deco building, the hotel has been a favourite with V V Puramites since 1965 (the year it started). Back then, there was an older version of the hotel right opposite. The old Modern Hotel does not exist anymore. We were taken in by the simple and elegant old world ambience of the hotel. Lunch was a typical Karnataka thali which had rice, chapattis, sambar, rasam, curds, papad with a tangy thondekai (ivy gourd) curry as accompaniment for the rice and sagu prepared from greens as accompaniment for the chapattis. I finished off my meal with a glass of buttermilk. 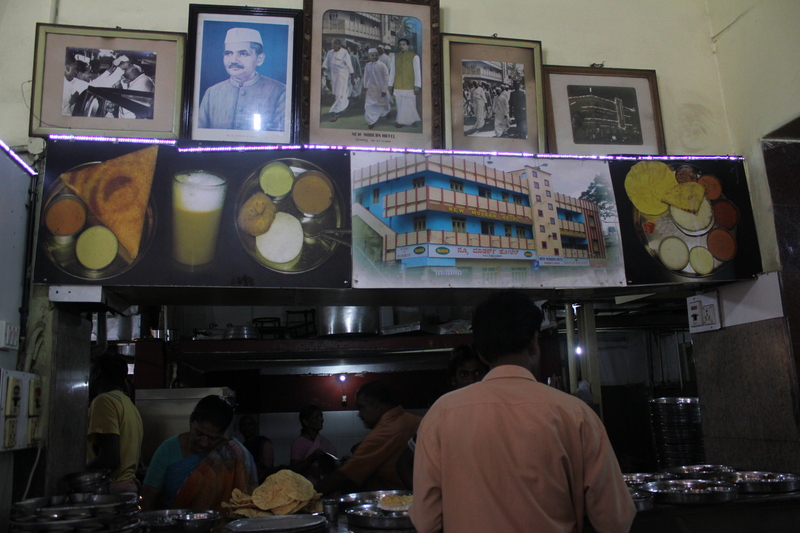 A Mangalore bun prepared from mashed bananas was an additional takeaway treat. 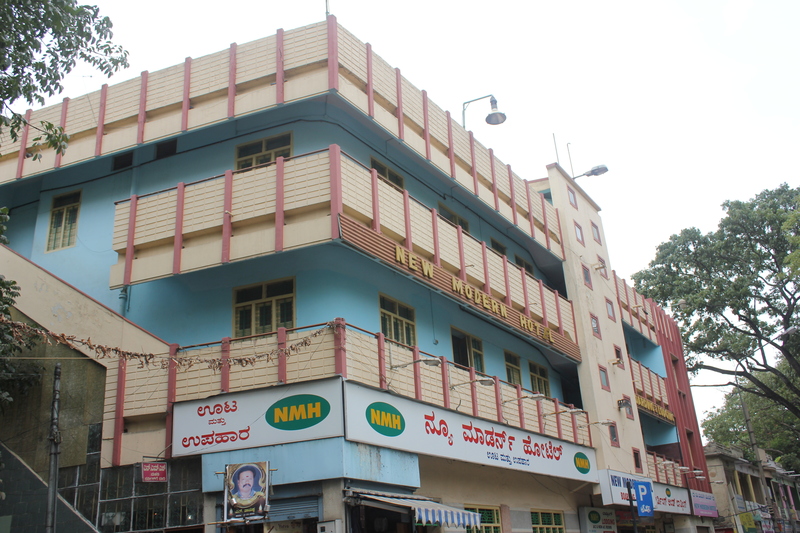 The New Modern Hotel or NMH is run by an Adiga family. 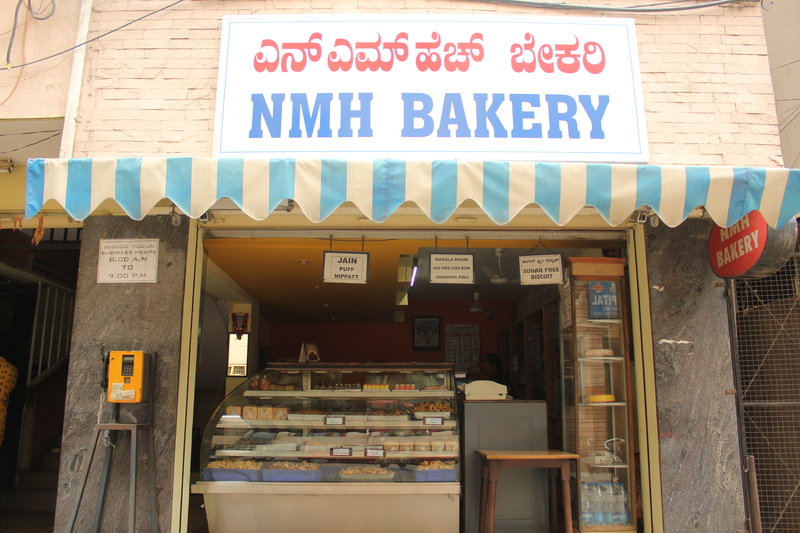 The NMH Bakery beside the hotel is a recent addition. As part of the walk we were asked to savour an item from the bakery. We couldn’t ask for more! It helped that our walk leader is an architect. As we walked we enjoyed the views of many vintage homes in the area. 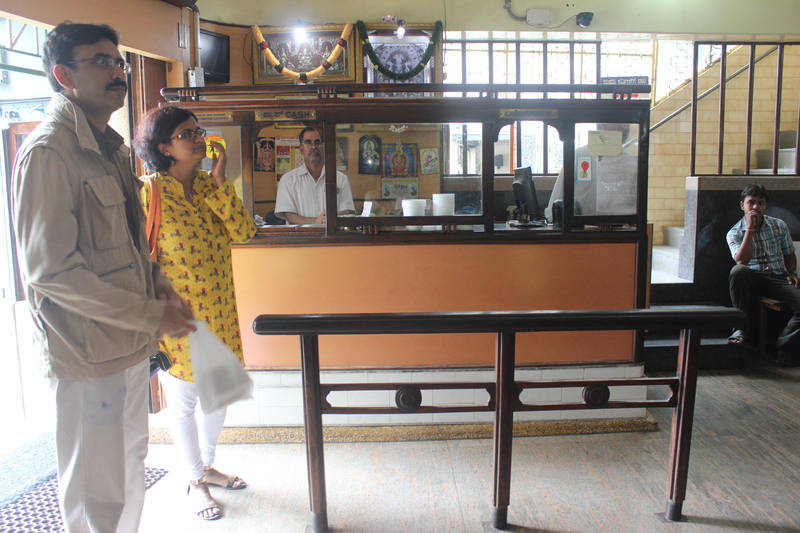 Thanks to Mansoor, we got acquainted with art deco architecture prevalent in 1960s’ Bangalore. An inmate of a charming vintage house was kind enough to welcome us in. To say that the interiors were classy would be an understatement. I just don’t have words to describe how it felt to be inside this house. The ceiling in the central portion of the house was high, there was ample ventilation and light. The red floor added to the brightness. 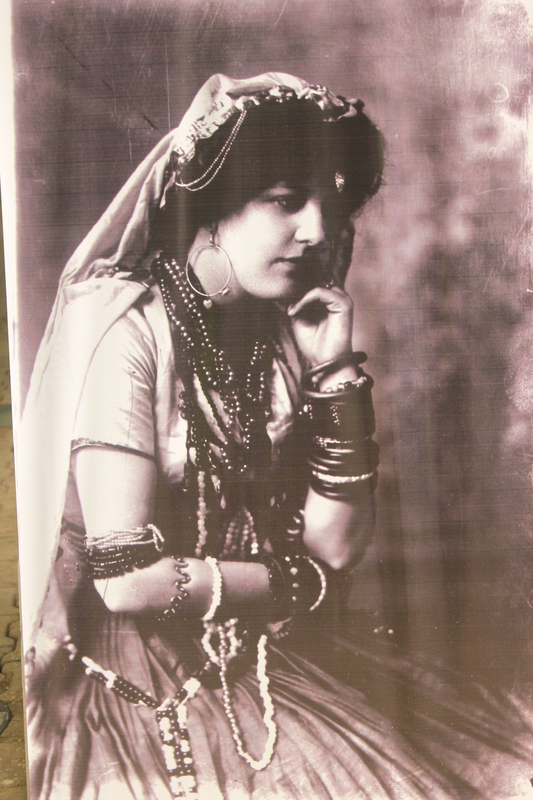 Our eyes were drawn to the sepia-toned photographs on the walls and paintings of deities by Raja Ravi Varma. 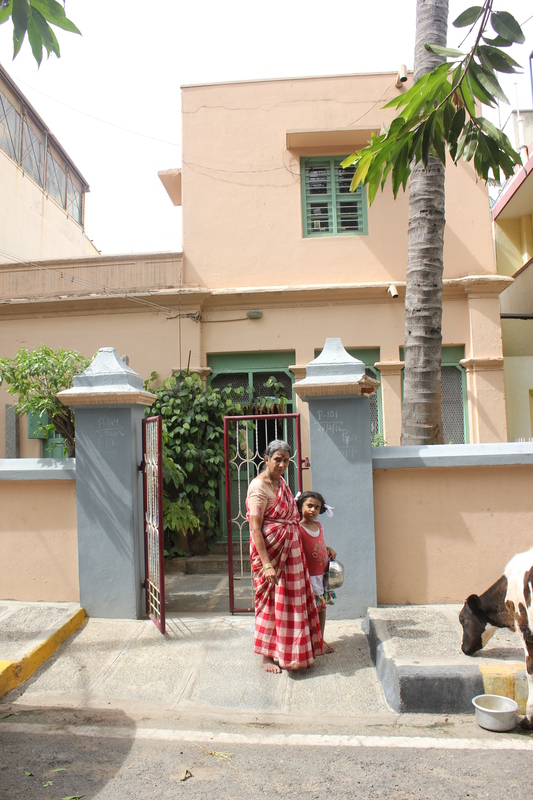 Our host explained that the house constructed 83 years back belonged to his father Mr Nanjundaiah, who worked in the Attara Kacheri (old name for the Karnataka Government office). The photos of Mr Nanjundaiah and his wife occupy a pride of place on the wall. Antiques and implements which were used in the 1960s adorn every nook and corner of the house. Bamboo poles hanging from the roofs served as indigenous cloth driers. Other rooms had Cudappah tile flooring. An old well in the rear of the house is used even today. Visiting this lovely house made our day! 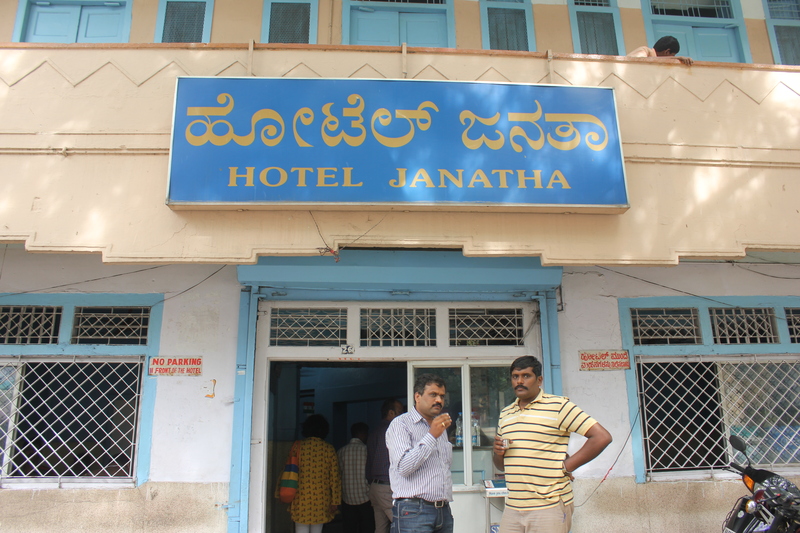 Our next stop was at the Janatha Hotel which has been in the area since 1965. A generous serving of Kesari Bath proved to be an apt dessert to the culinary and architectural feast we had that afternoon. But not before devouring a plate of crispy masala dosa 🙂. 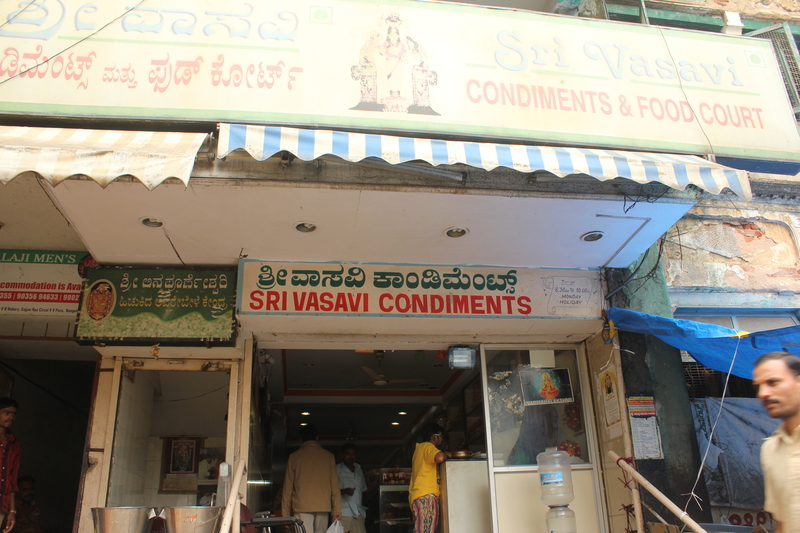 We next dropped into Vasavi Condiments most famous for its annual Avarekai Mela. The endless rows of shelves were teeming with various delicacies. Picking up something from here proved to be a hard task and I finally settled for spiral murukkus. The walk ended at V B Bakery. Over here, I couldn’t think beyond the Congress buns so I packed a couple of them as a takeaway. 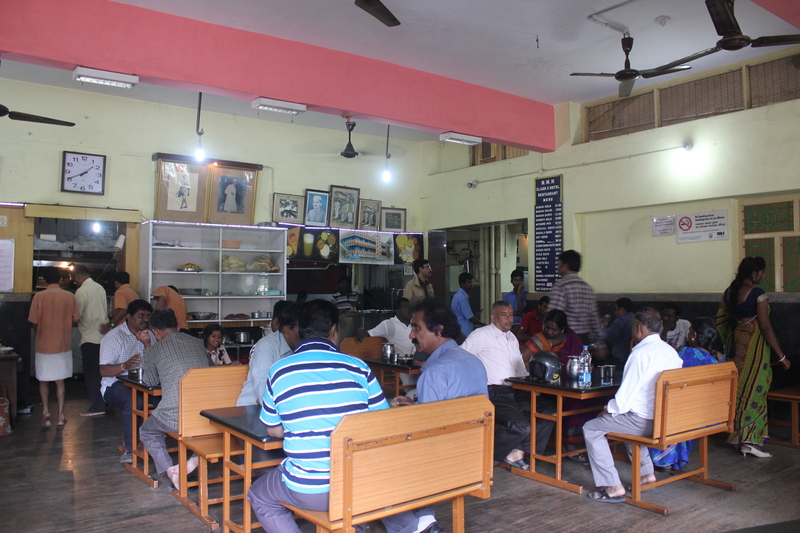 Like the Basavanagudi Food Walk, this one too is a treat for foodies and will leave you wanting more! This is just a tongue-in-cheek piece with no offence meant to any kind of employee. Every company has different kinds of employees. Here I have listed 10 such kinds. You may belong to one or more of these kinds. They are always at office on the dot even if there is an earthquake or thunderstorm. The Punctual Ones swipe into office at the slated time even as the Late Lateefs have their first bite of breakfast. Some extreme cases swipe in before sunrise. (2)Auto driver said he was taking a short route but it turned out to be longer than the long route. (3) My dog caught my pants and wouldn’t let me go. (4) Remembered it was my wife’s birthday at the last minute. (5) Had to go to the bank. (6) Barber cut my hair too short. Spent a lot of time brooding. (7) Absentmindedly drove to my old office. (8) Realised only in the morning that my son hadn’t finished his homework. One of my favourite places in Bangalore, the National Gallery of Modern Art, is celebrating my favourite passion, photography, in a most wonderful way. The NGMA is playing host to a month-long (21 June – 20 July; extended to 14 August) exhibition of vintage photographs from the collection of Raja Deen Dayal, who could easily be called the ‘Father of Indian photography’. 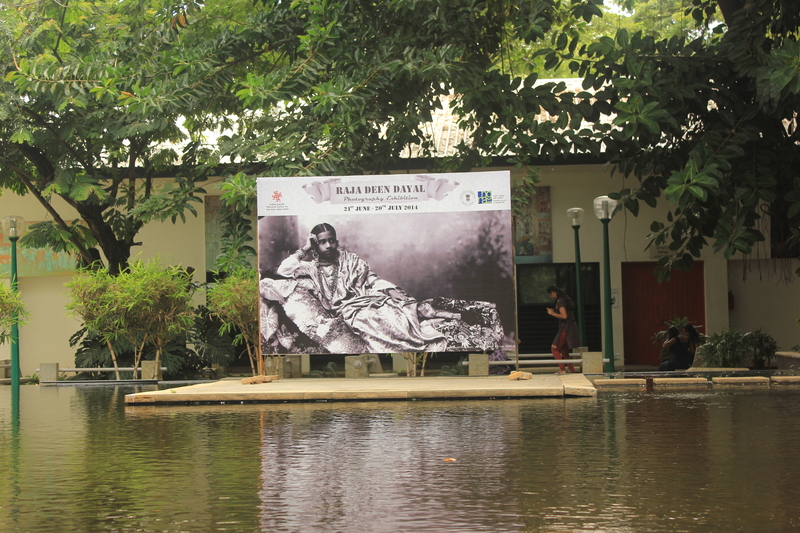 A photo by Raja Deen Dayal adorns an exhibition hoarding at the NGMA. 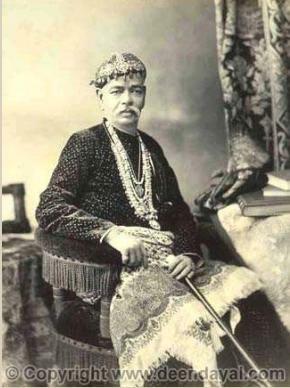 Raja Deen Dayal whose career spanned three decades from 1874 to 1905 was the court photographer of the sixth Nizam of Hyderabad, Mir Mahboob Ali Khan. His dazzling career also included stints as the photographer to the Viceroy of India and also Her Majesty Queen Victoria. The iconic photographer’s name is synonymous with 19th century photography in India. Born in 1844 to a middle-class Jain family at Sardhana near Meerut, Deen Dayal was the only Indian photographer who was on par with his European peers. It is highly commendable that he excelled in spite of stiff competition from innumerable British photographic studios that dotted British India. The holding of this exhibition is largely thanks to the Indira Gandhi National Centre for the Arts which in 1989 got possession of 2857 glass-plate negatives from the great photographer’s estate. Most of the 150 plus photos on display are uncropped because of which visitors to the exhibition get a peek into the photo studios of those days. There are portraits of the photographer, pictures of many heritage monuments of central India, scenes from colonial India, and portraits of many maharajas and princes. Keen observers will also come to know of the difficulties the photographers of those days faced. Deen Dayal got introduced to the camera in 1864 when he was studying engineering at Roorkee. Photography was introduced as a subject at his college. From then on there was no looking back. Though he started his career as a draughtsman with the Secretariat Office in Indore, he soon switched over to photography when there were rumours that draughtsmen would soon be replaced by photographers. 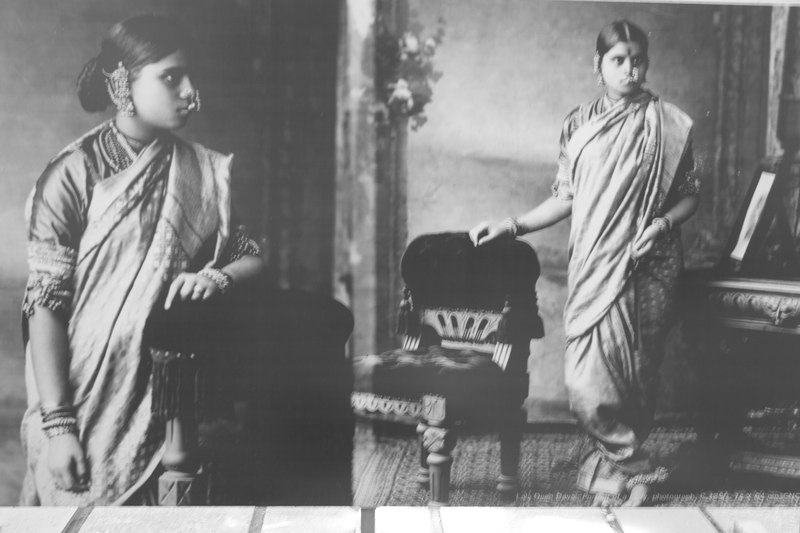 In 1874, he opened his own photography studio at Indore. His mesmerizing clicks soon caught the eye of Maharaja Tukaji Rao Holkar II of Indore and Maharaja Anand Rao Puar III of Dhar. In no time, he bagged prestigious assignments. He was photographer to many Viceroys before being appointed as Queen Victoria’s photographer in 1887. 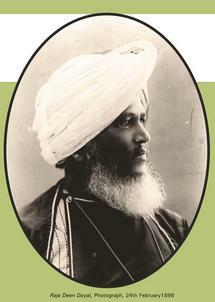 He worked for the Nizam, his biggest patron, from 1885 till his death in 1905. Around the same time, he opened his studio Deen Dayal & Sons in Secunderabad. He ran the studio with a staff of 50. 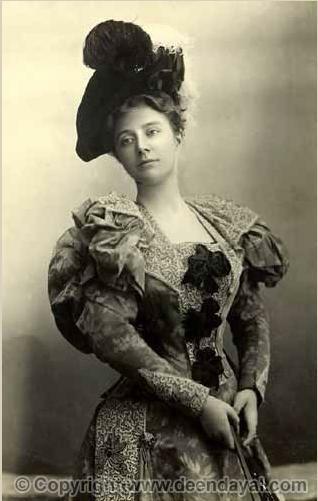 In 1890, he opened a studio only for women which ran under the name Zenana Studio. The idea of having such a studio was to protect native ladies from the “gaze of the profane and the stern”. In the same year, Raja Deen Dayal decided to close his Indore studio and opened one in Bombay (now Mumbai). The studio, which ran under the name Raja Deen Dayal and Sons: Art Photographic Salon was at 132, Hornby Road in the city’s Fort Area. 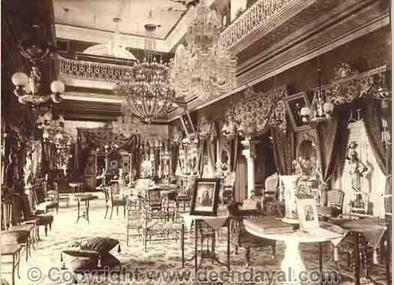 It had such distinguished clients like Sir Jamshedji Nusserwanji Tata and was run by his son Gyan Chand. 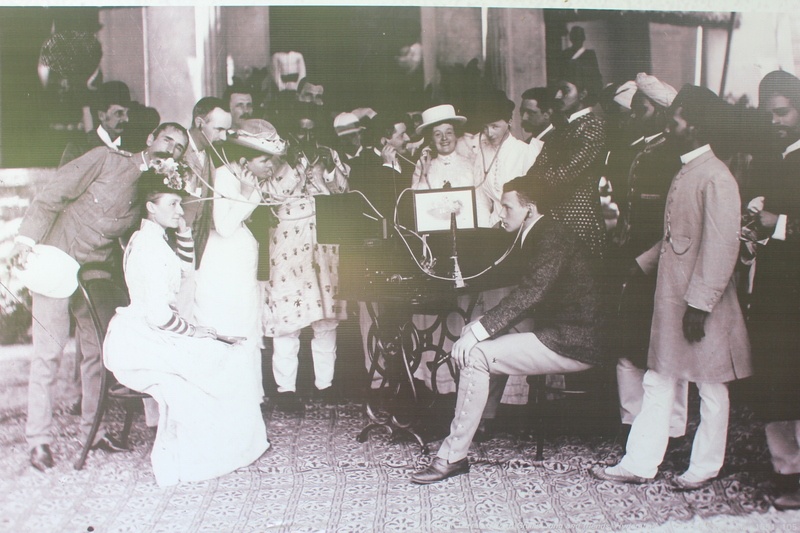 Besides his innate photographic talent, Raja Deen Dayal had excellent diplomatic and communication skills. This explains his large clientele that was an equal mix of Europeans and Indians. Working for the Viceroys and the Queen led to Deen Dayal travelling intensively across the country. Among his eye-catching works are those created with multiple exposures on a single glass plate. His subjects took great pain to dress up as is evident in the portraits of the royals and those of Mrs. Newport Tinley and Mrs. Smalley. 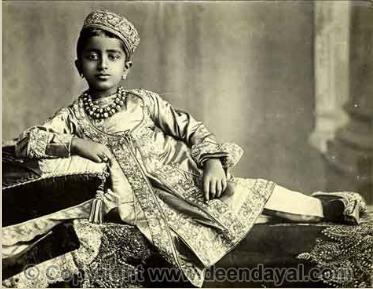 Deen Dayal managed to get excellent poses from all his subjects. 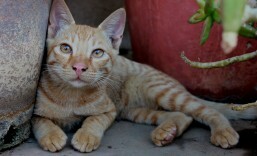 Also noticeable is the similarity in the poses of all his subjects. Photos of the hoi polloi will give you an idea of life in the late 19th century. 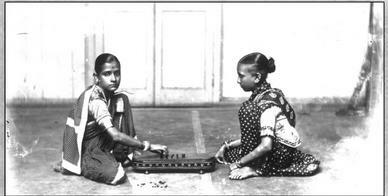 Among these, a photo of women playing a board game and that of a mendicant stand out. He photographed monuments from different perspectives. 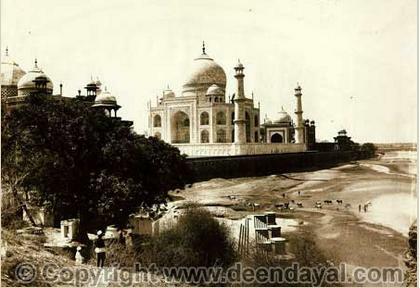 There is an 1885 picture of the Taj Mahal captured along with other monuments in the vicinity. Also eye-catching is an 1890 street view of Hyderabad with the Charminar in the background where the viewer’s eyes are drawn across the entire expanse of the street to the majestic monument. You will find it difficult to take your eyes off the magnificent entrance of the Faluknama Palace and the Vinay Vilas Mahal at Alwar. There is an 1885 photo of the Bulund Darwaza at Fatehpur Sikhri with the huts and mud structure in the foreground. Their presence in the frame accentuates the beauty of the monument. Other awesome photographs are those of the Madras High Court (1897) and Kolkata Street View (1899). Some monuments have men posing beside them to provide a comparative scale. The many photographs of palace interiors are particularly exquisite. Among the royals, a very impressive photograph is that of the young Sahibzadi Nizam-un-nisa Begum in regal finery flaunting a seven-string Hyderabadi pearl necklace. 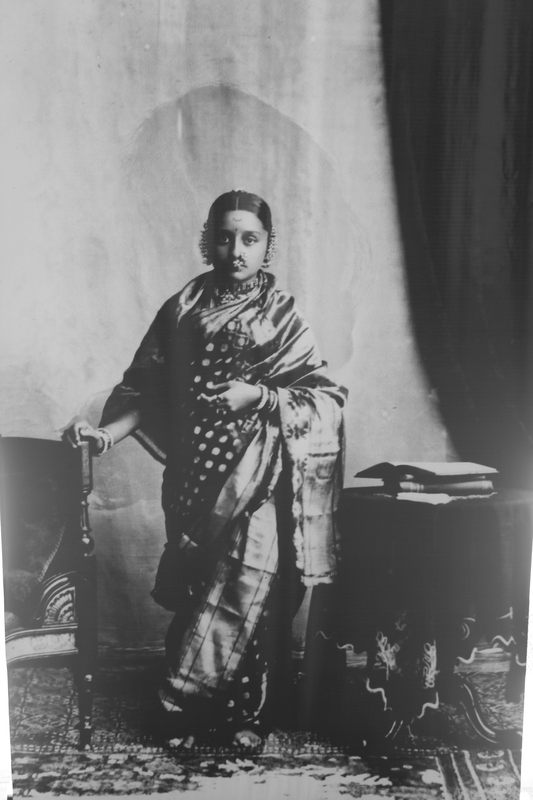 The princess who was one of the daughters of the sixth Nizam unfortunately died very young. 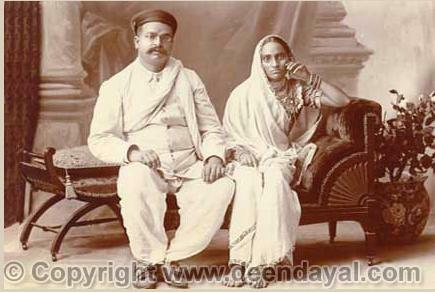 Raja Deen Dayal shut his Bombay Studio in 1904, a year before his death. His Secunderabad continued to be run by his son and later grandson. 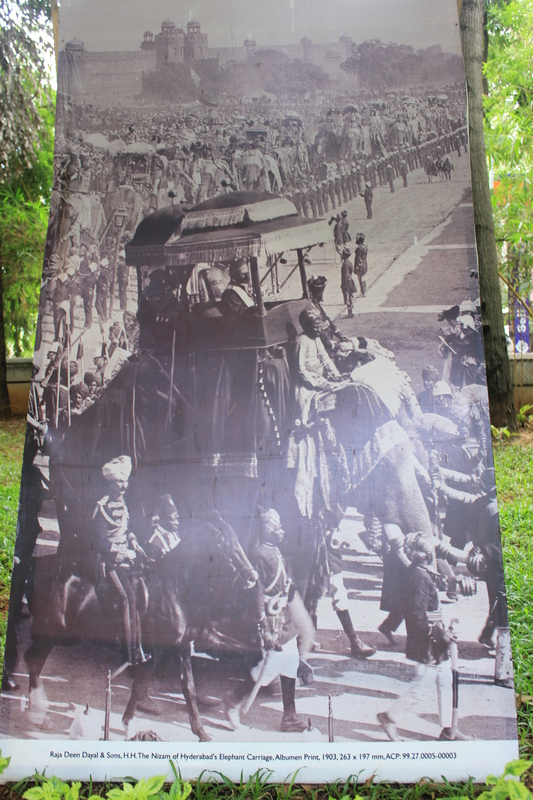 A hoarding at the NGMA with a picture of the Nizam’s Elephant Carriage, 1903. This is one exhibition you ought not to miss! 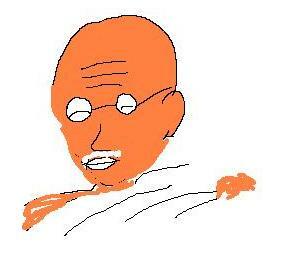 We always turn to exemplary human achievers and religious gurus for inspiration. Sachin Tendulkar has a zillion fans, the Dalai Lama is revered all over the world, a talk by Sri Sri Ravi Shankar draws huge crowds. Everybody wants to be a Bill Gates or Richard Branson. There are also many who deify mythological and comic characters and have pictures and posters of them all over their rooms. Let me take a detour from the usual and instead write about an offbeat icon who a majority of us don’t even give a second look to. You will see these poor animals all over the roads. Their sad eyes speak of their terrible lives. They are flogged every now and then but have to endure the pain and continue working. They have no choice. They dare not complain. And they are never rewarded. A majority of them are not properly fed. Why can’t we learn from the bullock. Why can’t we derive inner strength from him and look to him for inspiration. If he can continue slogging in spite of all the flogging, we too can continue with life unperturbed in spite of being flogged by life’s difficulties. Likewise, your road to attain knowledge will never be hassle free. It can sometimes drive you to despair or cause you to break down. Never stop. Carry on like the bullock. He never gets rewarded but one fine day you will. 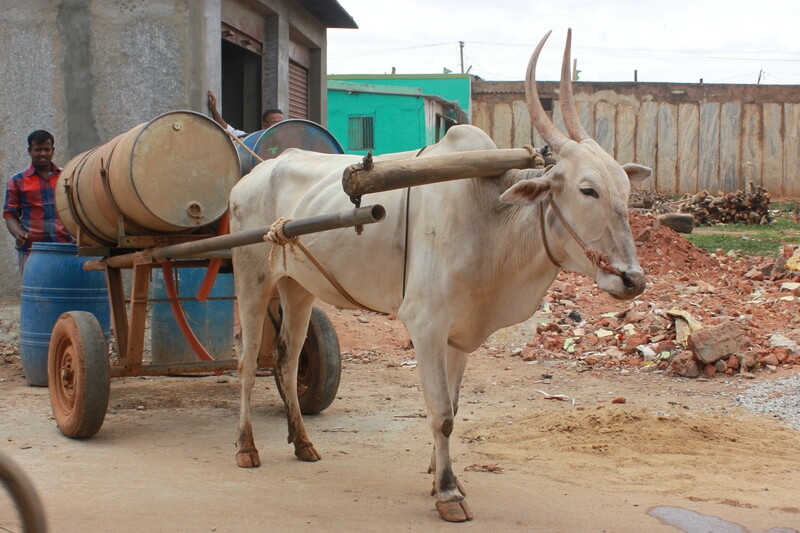 It is high time we look at the beast of burden as a source of inspiration.